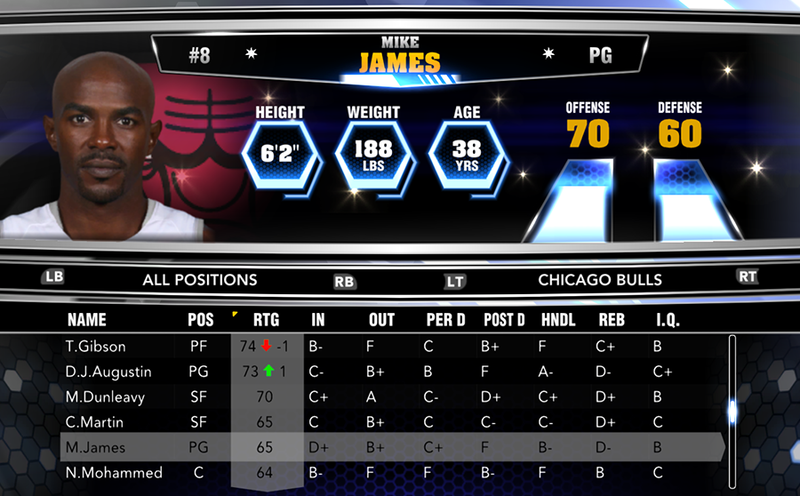 In the latest NBA 2K14 update released today three players were added to their respective teams. The 10-day contracts for Mike James, Chris Johnson and Vander Blue have been completed. This update also deactivates a number of players in the roster to reflect the injuries. Brandon Davies (out until at least late February). Kirk Hinrich (questionable for next game). Avery Bradley (out until at least early February). Pero Antic (out 2 to 4 weeks). DeMarcus Cousins (questionable for next game). Rudy Gay (questionable for next game). Landry Fields (out for 3 weeks). Malcolm Thomas to F.A. (waived by the San Antonio Spurs). Tyshawn Taylor to F.A. (waived by the New Orleans Pelicans). Mike James has been added to the Chicago Bulls roster (from Free Agency). Chris Johnson and Vander Blue have been added to the Boston Celtics roster. Malcolm Thomas signed by the Utah Jazz off waivers. Othyus Jeffers signed by the the San Antonio Spurs from D-League. Robert Covington recalled by the Houston Rockets. Overall ratings & attributes update.